Does your company have a European or international dimension? Do you wonder about its strategy? Do you wish to have more at your disposal to play your role? DO YOU WISH TO SET UP AN EWC, IMPROVE HOW IT FUNCTIONS, OR (RE)NEGOTIATE YOUR AGREEMENT? A toolkit with theoretical information, practical exercises or role-playing scenarios. To assist you in (re)negotiating agreements, allowing you to exercise your prerogatives and influence employer decisions. Upon trade unions request! Understanding the information and consultation process, and the notion of transnationality. Enhancing the coordination between the different local, national and transnational workers’ representative bodies. DO YOU WISH TO TRAIN AND KNOW MORE ABOUT SETTING UP AN EWC, AS WELL AS ABOUT YOUR RIGHTS AS AN ELECTED EWC REPRESENTATIVE? Initial training courses for all new EWC members and an in-depth set of courses on recurrent topics related to the functioning of the EWC. To give you the key information to carry out your mandate and ensure the EWC good functioning. Clarifying the roles of the president, secretary, select committee and the elected / nominated representatives of the EWC. Tips for renegotiating a sound EWC agreement. ARE YOU CONFRONTED WITH A RESTRUCTURING PLAN? ARE THERE JOBS AT RISK? the impact on the organisation and the workers’ working conditions. The divestiture of a business: advice and support in drafting the EWC’s opinion. Reorganising R&D of a business in several countries: impact on job pro les and the number of jobs. ONE OR SEVERAL EUROPEAN SITES WITHIN YOUR GROUP ARE STRUGGLING; AS THE EWC, DO YOU WISH TO ENSURE THAT IT IS SUSTAINABLE? To equip the EWC with a methodology to support struggling sites, assist them in pinpointing and highlighting the skills of their workforce with the aim of finding new business. Convincing the group to bring in new business by identifying the site’s technical and organisational skills that will allow it to reposition itself at the heart of the group’s strategy. Highlighting the expertise of the workforce and the organisation of the sites or business units to a new shareholder. ARE YOU WONDERING ABOUT YOUR COMPANY’S CSR COMMITMENTS OR ABOUT ITS SUSTAINABLE DEVELOPMENT STRATEGY? To analyse the SD-CSR reports (social and environmental impact, human rights and the fight against corruption). To allow workers’ representatives and trade unions to shape management’s strategic choices. Following up the implementation of sustainable development agreements in the company or those regarding the supply chain. Jobs and skills evolution as part of ecological transitions. IS YOUR COMPANY UNDERGOING TECHNOLOGICAL CHANGES AND YOU WISH TO ASSESS THEIR REPERCUSSIONS ON THE HEALTH OF THE WORKERS? ? To analyse and anticipate the changes in the production processes. To understand the working and health conditions aspects of a project to propose improvement and areas of prevention. New technologies in the commerce sector: e-commerce, click & mortar, robotisation of warehouses, etc. Automotive and pharmaceutical sectors, climate change and industry, etc. DO YOU WISH TO COMPARE THE WORKING CONDITIONS BETWEEN THE DIFFERENT COUNTRIES IN WHICH YOUR COMPANY IS SET UP, AND AVOID COMPETITION? To analyse the disparities between countries, by using a methodology tool developed by Syndex to identify the company’s corporate practices and assist labour unions form their demands. workers’ standards of living as a means for analysing pay gaps. The interpretation of absenteeism: legal differences and managerial policies. Syndex offers customised CSR training courses. Courses last between two hours and two days. They will provide you with an introduction to CSR challenges and methods. Syndex is by your side during the restructuring operations, but not just then, because prevention is better than cure. Building a long-term partnership with you helps us to provide you with the best solution to your needs and to anticipate the changes in your company as well as in its sector. Our objective is to ensure that workers take part in the company’s decision-making process and to give you the means to support your opinion and reinforce your action. Which is why we adapt our service o er to your needs and to the situation of your company or line of business. 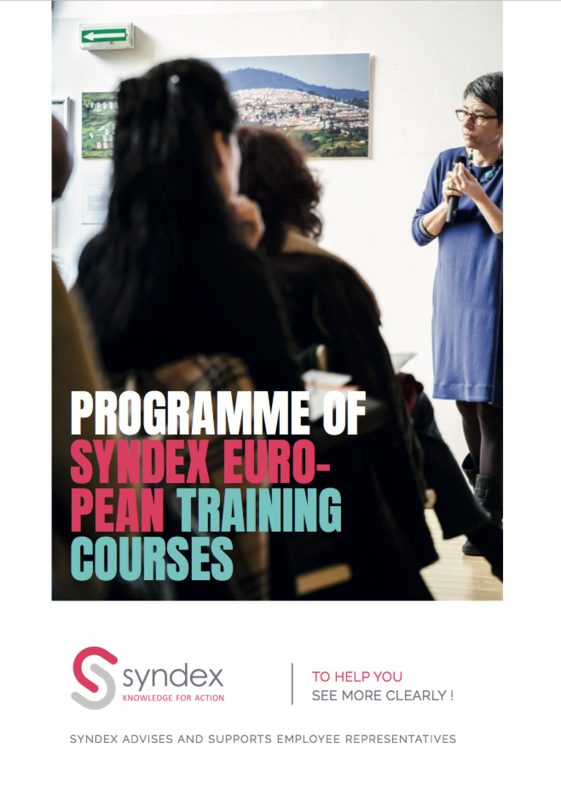 For European works councils, Syndex mobilises its European offices: Belgium, Spain, France, Poland, Romania and the United Kingdom. Our teams are, therefore, closest to the economic, social and trade union-related realities of the European works councils that they support. To enable European works council members to give their opinion during a consultation process, the European Directive of 6 May 2009 provides that they may receive training, and use the services of experts. EWC training courses : download our catalogues ! Europäische Betriebsräte - Sie möchten sich das Rüstzeug holen, um ihre Rolle Wirksam wahrzunehmen? European works councils - Do you wish to have more at your disposal to play your role? Europejskie rady zakładowe - Potrzebujecie środków, aby móc odegrać swoją rolę? Comitete europene de întreprindere - Doriți mijloacele necesare rolului dumneavoastră?